Depression affects more than just mood. Depression can interfere with one’s ability to think clearly, among other symptoms. If you have noticed that your loved one can’t seem to remember dates or appointments, is inattentive during conversations, is highly disorganized, or has difficulty making decisions, these may be signs of cognitive impairment. The following resources, collectively known as “More Than Mood: A Depression Symptoms Toolkit for Families and Caregivers”, explain how ROAM symptoms (Reasoning, Organization, Attention, Memory) may appear, provide strategies for caregivers to help their loved ones, and offer real-world family stories that show how families have found positive coping solutions to deal with cognitive impairment. When you finish using the toolkit, fill out this survey to provide feedback. We’d love to hear from you. Watch PART ONE and PART TWO of “A Guide to the More Than Mood Depression Symptoms Toolkit” to better understand the purpose of the toolkit and how to access each resource. Includes an interview with Dr. Ron Manderscheid, Executive Director of the National Association of County Behavioral and Developmental Disability Directors. Your loved ones may exhibit signs of forgetfulness, trouble making decisions, distractedness, or problems with planning, organizing, or analyzing. We call these the ROAM symptoms–Reasoning, Organization, Attention, and Memory. These symptoms can have a negative effect on family relations. You may wonder, “Why can’t my wife remember to pick the kids up from school on time?” or “Why does it seem like my sister is never truly listening when I talk?” ROAM symptoms, when coupled with changes in mood, can noticeably alter one’s behavior and personality and put additional strain on the family caregiver. These fact sheets offer a detailed description of ROAM symptoms, how ROAM symptoms affect the family, action steps that family caregivers can take to address ROAM symptoms, suggestions on how to interact with providers, and a symptom tracking chart. What are the ROAM symptoms of Depression? This 52-minute webinar goes in depth into familiar depression symptoms, depression symptoms related to thinking (cognition), how you may recognize cognitive impairment in a loved one, and helpful techniques to use to support someone struggling with cognitive impairment. Alice Medalia, Ph.D., is the webinar facilitator. Dr. Medalia is the Clinical Director of Cognitive Health Services at the New York State Office of Mental Health and a Professor of Medical Psychology at Columbia University Medical Center. She also provides clinic leadership to the Lieber Recovery Clinic in New York. People living with depression may experience slower processing speeds, another indicator of cognitive impairment. Processing speed refers to the speed or ease with which a person can take in information. Watch this video to see a dramatization of what it looks like when someone struggles to process a lot of information at one time. This video is part of a series available on the Teach Recovery website. The Depression Wellness Analyzer helps people with depression and their families actively monitor the person’s depression treatment to get well faster. 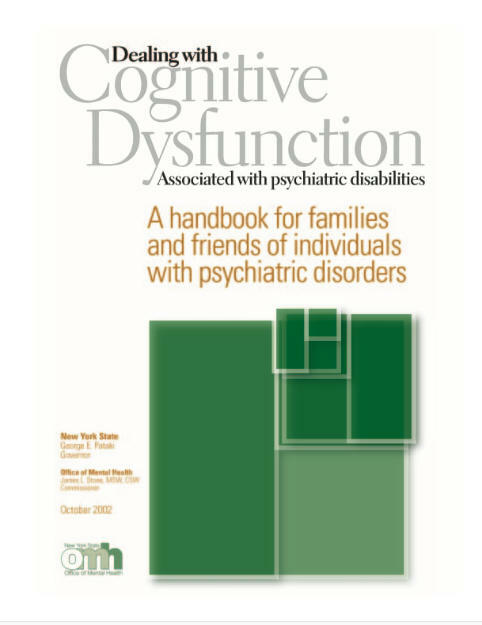 This handbook, produced by the New York State Office of Mental Health, covers why people with mental illness may be affected by cognitive dysfunction, the impact on daily functioning, treatment, and what family members can do to help improve symptoms. Take our toolkiit survey! We’d love to hear your feedback on this resource. Families for Depression Awareness (FFDA) developed the “More Than Mood: A Depression Symptoms Toolkit” with review by FFDA-affiliated experts. This project was supported by a sponsorship from the Takeda-Lundbeck Alliance. Takeda Pharmaceuticals and Lundbeck were not involved in content development. The content and opinions expressed in the toolkit are solely those of FFDA and the experts involved.